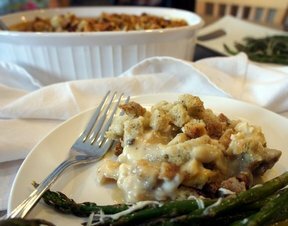 This creamy chicken casserole is very flavorful with the combinations of soups and the stuffing mix makes the perfect topping. 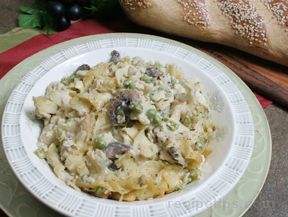 It is simple to make and you could even speed up the process more by using rotisserie chicken from your favorite deli. Cut the chicken breasts into small serving size pieces. 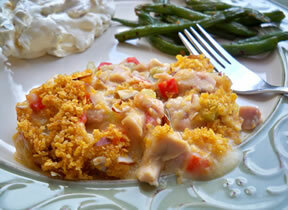 Layer the chicken pieces in a greased 9x13 baking dish. Mix sour cream and soups in a mixing bowl. Pour mixture over chicken. Take seasoning packet from stuffing and mix with chicken broth in a small saucepan; bring to a boil. (You can also bring them to a boil in the microwave if preferred. 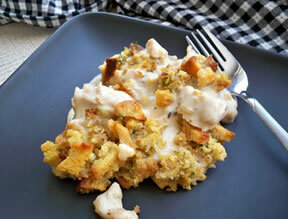 Layer dry stuffing mix over soup and chicken mixture. Carefully pour broth mixture evenly over the stuffing mix. Bake about 30 minutes or until stuffing is brown. Note: Canned chicken or rotisserie chicken can be substituted for chicken breast. "Great weeknight meal. I used rotisserie chicken and that made this recipe super simple. It was ready in no time and everyone loved it."